Small is beautiful, a description that perfectly suits Capannino. This converted barn is a fantastic bolthole for two – what’s more, it’s right on the edge of medieval Siena, one of Tuscany’s top sights. Deceptively spacious, it has a large shaded terrace, set with a barbecue and table and chairs, where you can relax amid the pretty flower pots and look out on the surrounding lush countryside. Inside, a large glass sliding door opens onto a generous open-plan area for cooking, eating and dining, while a luxurious double bed can be found on the mezzanine level. These airy spaces are enhanced by cool white tones and smart modish furnishings. When you aren’t putting up your feet, there’s plenty to explore in the area. As well as being a couple of miles from historic Siena, the villa is on the route of the famous annual Chianti bicycle race, L’Eroica. If you’re a cyclist yourself, this is also the gateway to some wonderful (if strenuous) outings by bike – you could even try out the famous Eroica and Strade Bianche race routes. Sofa, two armchairs, table with chairs, wardrobe, footstool, fully equipped kitchen, stairs to mezzanine, main entrance. Double bed (cannot be converted to twins), chest of drawers, cupboards, storage chest. This villa for two is hopelessly romantic, a mood enhanced when dining out on the terrace under the night sky. But cycling enthusiasts might like it too – for it’s on the route of the L’Eroica and other Strade Bianche trails. Capannino is also right on the doorstep of one of Tuscany’s unrivalled treasures, the beautiful medieval city of Siena, as well as the many cellar doors of the region. One bedroom. There may be some traffic noise from a nearby country road. The owner of Capannino can offer cooking classes to her guests, located at her nearby farmhouse. There is also a local stable which offers horseback riding. There is currently no pool. The nearest grocery shop is approximately 1km away from the villa. Here there is also a popular restaurant “Antica Trattoria Botteganova”. 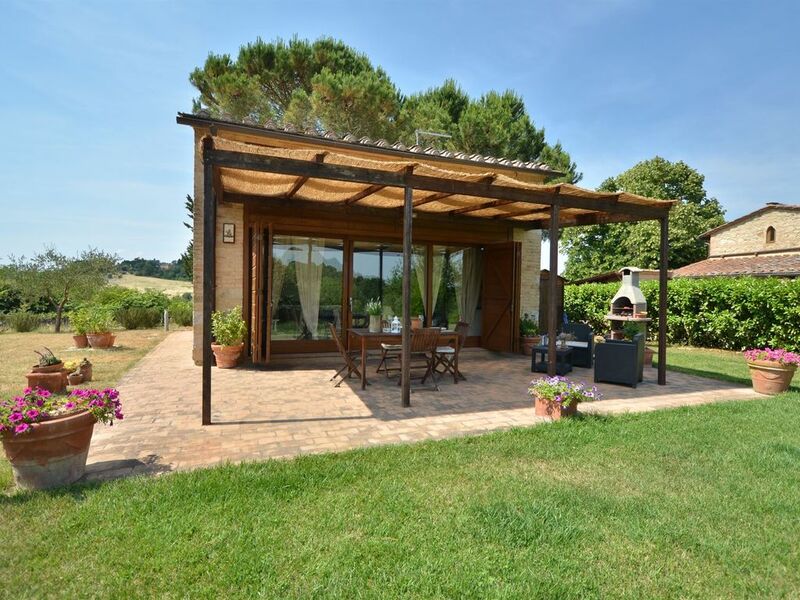 Siena which is only 4km away has all the necessary amenities including a supermarket, bank and pharmacy. Siena also has many wonderful art galleries, museums, bars and restaurants and has been awarded the status of a world heritage site.